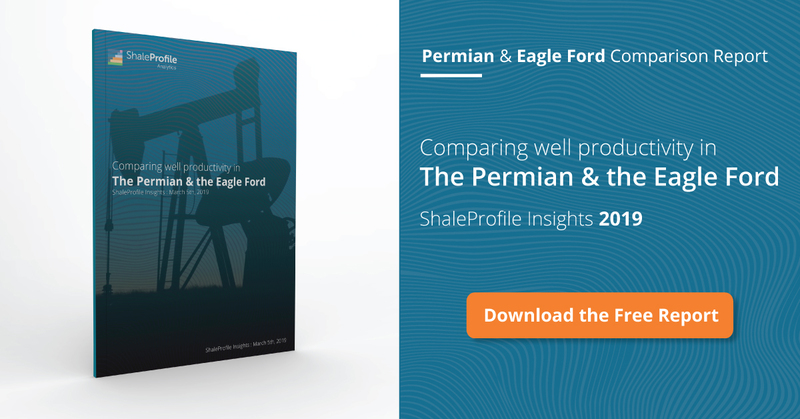 This interactive presentation contains the latest oil & gas production data from 12649 horizontal wells in the Permian (Texas & New Mexico) that started producing since 2009/2010, through August 2017. As explained in my post on the Eagle Ford, now that I have access to ‘Pending data’, the production data I can show for Texas is far more complete than before (and will be revised less). The result is that I can share the preliminary production figures up to August already. Although data for New Mexico is included, I have deselected it in some of the views, like the one above, as it is fairly incomplete for recent months. As the graph shows, oil production in the Texas side of the Permian has grown steeply in the first half of 2017, faster than in any other 6 month period. In August, more than 70% of the total oil production was produced by wells that came online since 2016. The difference with my previous posts on the Permian is quite large, as a significant amount of production was not yet processed by the RRC (and thus had the status ‘pending’). The “Well quality” overview shows an important factor behind this growth: the average production profile has improved significantly in recently years. The profiles from wells that started since 2016 are now very similar to those in the Bakken (ND). If you select Pioneer Natural Resources in that overview (using the Operator selection), which is the largest oil producer in this region, you can see that its wells are better than average; the ones that started since 2016 recover on average more than 200 thousand barrels of oil in the first 20 months on production, double the amount of wells that started in 2014. This “Ultimate recovery” overview shows the average cumulative production versus production rate, for all these horizontal wells in the Texas Permian basin, grouped by the quarter in which they started. The second quarter of 2016 appears so far to mark the end of several years of performance increases. The last tab (“Water ratio”), shows the water oil ratio for all these wells. I have estimated the actual water production from regular well test data. On average, just below 3 barrels of water are produced for each barrel of oil. On Thursday I will have a post on all the 10 states I cover in the US. Enno, I’m a huge fan of your work and the interactive charts you use to present the data. I think it is a great tool to fact check some of the claims that shale companies present in their slideshows and conference calls. Now that you have access to the pending file, do you have any sense how complete the Texas data is for the most recent months, or will that only become evident over time? I was indeed hoping that that would be one of the possible uses of the data shown here. > Now that you have access to the pending file, do you have any sense how complete the Texas data is for the most recent months, or will that only become evident over time? My impression so far is that the pending data covers more than half of the revision data, but I’ll try to say something more about it in the Texas updates next month. Your article “Permian – update through June 2017” from october 12th learned me that the production crossed the 1000k level in january 2016. Now this article learns me that the 1000k level was crossed in november 2016. Nevertheless this article claims to be based om more complete data, since you have acces to ‘pending’ data now. What happened? What am I missing? Therefore, to compare this overview with the one you mentioned, please also select New Mexico in the “basin” selection below the graph. It looks like Permian oil is getting lighter. US refiners do not want it. See Willie Chiang comments during PAA question and answer session. The Permian oil needs to be exported. Michael (sic) [Matt] (45:47), this is Willie. This whole quality issue, we’ve been – we’ve got quite a strategy on that. I think we’ve talked about it quite a bit on building our systems in the Delaware Basin to be able to segregate. And our belief is that the barrels are going to be getting a lot lighter. If you look at the amount of 45-plus gravity. It’s about 300,000 barrels a day now, growing to 1 million plus. So, a lot of those volumes are coming, and that’s really the crux of the benefit of a Cactus pipeline being able to take that directly to the water because I think we are going to see a lot of pushback from refiners. We are already starting to see it as far as the lightning of the general stream going up to Cushing. The refiners don’t want any lighter. So, it’s an integral part of the strategy and a piece of everything we’ve been building. Krisvis, what makes you say that oil from the Permian Basin is getting lighter? I’d be curious to read your sources. Thanks!